Think you don’t like Brussels Sprouts? Think again. This tasty Walnut And Blue Cheese Brussels Sprouts recipe is the perfect side dish that will definitely change your mind. The countdown to Thanksgiving is on! I am so excited because I love to cook Thanksgiving dinner. It’s hard to believe that another holiday season is quickly approaching and soon we’ll be cooking turkeys, planning our menus and thinking about what deals we are going to score on Black Friday. I am the side dish queen when it comes to serving Thanksgiving dinner. I mean, a delicious side dish is just as important as the turkey itself. It’s the one day a year when I feel it is totally ok to overindulge in our food choices. Living on a farm, I am lucky to have so many great vegetables available. And while this was not the best year for our crops due to the excessive amount of rain we had this summer, we learn as farmers that we have to be thankful for what we have and take the good with the bad. That’s what the meaning of Thanksgiving is about – Being Thankful. Feeding America is an important job, something that we as farmers are honored to do. So let’s talk about this delicious Walnut and Blue Cheese Brussels Sprouts recipe. This recipe isn’t the same old boiled brussels sprouts that grandma used to make. 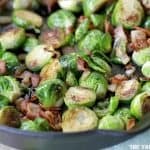 I’d like to say that it will change your life just like the Pan-Seared Brussels Sprouts with Bacon recipe I shared previously. It is the perfect Thanksgiving side dish. This recipe also showcases my love for blue cheese. I am so in love with it and realized how blue cheese perfectly pairs with Brussels Sprouts. And toasted walnuts and bacon is an extra bonus to top it all off. Sooooo good! So simple to make. So get your forks ready and dig in! Think you don't like Brussels Sprouts? Think again. This tasty Walnut And Blue Cheese Brussels Sprouts recipe is the perfect side dish that will definitely change your mind. Wash and cut brussels sprouts in half. Set aside. Heat a large skillet over medium heat. Add walnuts and toast for 5 minutes stirring occasionally. Remove walnuts from skillet and set aside. Heat oil in the same skillet over medium-high heat. Add brussels sprouts and season with salt and pepper. Sautee for 5 minutes until brussels sprouts begin to carmelize. Lower heat to medium and add chopped bacon and walnuts. Cook for another 10 minutes. Add 3/4 cup of blue cheese to the pan. Toss to coat. Remove from the pan to a serving dish. Top with remaining blue cheese. Save this Walnut And Blue Cheese Brussels Sprouts Recipe. Pin the image below to your favorite Pinterest board.